Here’s what our customers are saying about us. If you’re a customer, we’d like to hear from you too. Take our Customer Satisfaction Survey Here. So Glade We Chose Bud Polley’s! We are highly satisfied with our new shower! Jimmy and Jason in sales were very helpful in helping us select a complementary tile to replace our old tile shower. Jesse and his helper completed a top notch installation in 4 days! They respected our home and left the work area tidy each night! So glad we choose Bud Polley’s! If you are shopping for flooring, stop looking! I recently purchased new 7″ plank COREtec Plus Ivory Coast Oak Vinyl flooring from Zach at Bud Polley’s in Tipp City OH. WOW, they were terrific, start to finish. Zach was thorough, responsive and very patient. Pete and Jason, the installers, were also great to work with. 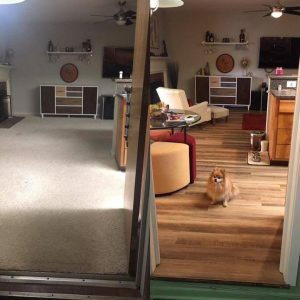 They took a lot of care in moving my existing furniture and did a beautiful job laying the new floor, keeping me involved every step of the way. Could I have ordered it cheaper on line? Maybe, but what a nightmare that would have been. I would have had to remove the tile, level the floors, etc. Don’t do it yourself! Call Zach! You won’t regret it! We had an idea of what we wanted, but didn’t have the vision to pick out our flooring using the samples. Shared our thoughts and ideas with Zach and shortly after he showed us what he thought we’d like. A few weeks later it was installed and we could not be happier! Zach nailed the look we were going for and Pete installed it. Our house looks like a whole new place and we appreciate all of their help making it happen. We highly recommend Bud Polley’s. Thank you Jason Jones for helping Mom choose the great porch rug! Bud Polleys is my place for all things flooring! We are having our new flooring laid this week. The floor, amazing and is transforming our entire home. Mike is easy to work with and knowledgeable about the products. Ryan is a true skilled craftsman. Thank you. The floor looks fantastic, I love it! Thank you! Had an amazing purchase experience. My wife and I felt very comfortable during the whole process. Thank you! Huge help from your sales team on picking out our carpet. And very professional installation services. Very quick. Zach with Bud Polly has volunteered with habitat for humanity installing carpet in one of our homes. Recently the family living there had a little baby girl and Zach even donated his personal rug! It fits perfect in their living room. We can’t thank him enough! Great people. Great service! Always great service and great results. They stand behind their products! Our floor looks great!! Thanks to Zachary and his patients in helping us decide between tile or wood. Our bamboo flooring in wonderful. Terry did a great job installing the floor. Thanks! This is not only a beautiful clean store, they are very helpful if you have a problem They have a beautiful selection of all kind of flooring needs. Wonderful selection of tiles. We picked out what we needed and was able to pick it up in 2 days! All of the salesmen were very helpful, especially Tom. We had a little hiccup with delivery but was quickly resolved. We would definitely recommend to others and we will be back for our next project! Jeff suggested the perfect carpet for my family room and master bedroom. I love it! At the last minute I decided to tile a portion, and again, Jeff listened to my description and found a solution. The installation team was great as well. Wonderful sales consultants and so many beautiful products! Great place! Extremely happy with the product, service and installation of our new hardwood floor. Zach in sales was helpful and accommodating in selection of the product and scheduling of delivery and installation. Roy, installer, was a professional and a craftsman who cared about the detail of his work. He also gave helpful tips in regards to caring for the floor. The floor has been installed for about a month and all who enter the house comment on its beauty. We couldn’t be happier with the end result. Highly recommend Bud Polley’s Floor Center. Both my daughters are first time home owners so value and price are extremely important to them. Jason was an excellent Salesman! He was very knowledgeable about his products, was friendly and easy to work with and went above and beyond to work with us on price! Both houses are scheduled to be installed (at our convenience) within the next few weeks and I’m sure they will be beautiful! Bud Polley’s Floor Center was not only very professional, reasonable in price, but also have a great sales/office staff! I would highly recommend Bud Polley’s Floor Center…and I’m sure whoever your sales person is would do great…but I would ask for JASON!!! We love our new floors! The guys did a great job installing them and we are very pleased with your company. Thank you for taking the time to meet with me and choose the perfect flooring for our new home. Your kindness and generosity meant the world to us. Your are appreciated. Bud Polley’s Floor Center was a pleasure to work with from the salesman to the installers. All of our flooring and window coverings have been done by Bud Polley’s Flooring. 19 years in our current home. Both the sales person (Zach) and the installer (Pete) were wonderful. Zach helped me pick out carpets for my bedroom as well as vinyl planks throughout my dining and family room. The installation process went smoothly with Pete explaining everything in detail. I could not be happier with the outcome. Over the last 5 years Bud Polley’s has put new carpet throughout our entire home. The quality and service goes above and beyond. Thanks so much to Zach and Jason for ALL your help!